Good Gracious, where do I begin? I have been thinking alot about another swap, and since being smitten with mittens of late, my thoughts were about doing a mitten swap this winter. In my mind, I've created the blog entry, the rules, the blog button. A mitten swap, because we all love mittens, right? Then, at the end of last week, I had the opportunity to speak to an incredible man, who leads a church in Buffalo. His name is Pastor Angel Gauthier, and he has such a heart for the children in one of the worst areas of the city. These are children without parents, and if they have parents, most are crack addicts or prostitutes, or are in jail. Many of the children are being raised by other family members. Just last week, a teenaged boy from Pastor Angel's youth program was shot on the street. Pastor Angel calls his neighborhood the "shooting gallery." As I talked to him about the impact his ministry had in the community, with great delight he told me about the love for these kids, and how their ministry feeds them and loves on them, teaches them and provides for so many of their needs...How they bring their parents and the parents lives are changed because of the outreach of this church. He also expressed how the needs were so great. When I asked him what we could do , he told me how they needed another 15 seat van, clothing for the children, food, finances. And he said, "we simply need mittens for the children for Christmas." "Mittens???? Pastor", I said, "I will get you mittens." All of Thursday, my mind was spinning and my heart was full. As I shared my thoughts with a few other people with whom I work, the excitement grew. Tim, our graphics designer, has worked with me for the past few days to create a flyer. When I thought of the mittens that would be made or purchased, I imagined that it would be so neat to include a hang tag on each pair. Contemplating the expense of said hang tags,and realizing the expense would be beyond my budget, within minutes, Mark Aahrens, from Aahren's Graphics came into my office. I told him what I needed, and he said, "Whatever you need, it's yours." So, today, I am launching a Mitten Collection. Not a Mitten Swap. Because there are 300 children whose hands are cold, and whose hearts need warming. And I am asking you to help. 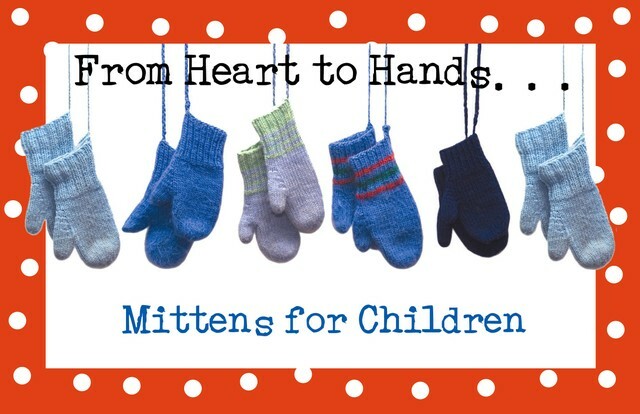 If you can make mittens or buy a pair of mittens and would care to donate them to this amazing project, I promise you, these children, and Pastor Angel who leads them, will be blessed by having one of their smaller needs met. I urge you to share in this wonderful project. Grab a blog button, and link it to this page, so we can all share the love! and then begin a "Heart to Hands" project of your own for next Christmas. You may email me for an address to which to mail your mittens and for any additional information. I NEED MITTENS BY DECEMBER 10TH! And you thought I was going to announce that we sold our house, didn't you? And, we can still do a mitten swap, too. Oh yeaH1 'Tis the season. I am absolutely in. What a good feeling to know that one little childs finger will be warmer because of our mittens! Thank you for putting this together! For some reason I couldn't email you. I know this will show up on your comments but that's okay! Please email me at paulaniz67@yahoo.com with the mailing address for the mittens. what a lovely project. Where should we mail mittens to? AND..Congrats on selling your house Lynne ! Woo-hoo. I grew up in Buffalo and I know how cold your hands can get. I am thinking superwash wool cause acrylic or cotton just won't cut it. I am so in. I will try to go out and get some RED superwash today!!!! Great idea! I would love to knit a pair - when do you want them by and please let me know where to send them. Absolutely fantastic! Please tell me where to send... I have so many mittens that my kids have outgrown (they seem to multiply when I'm not looking -- I'm never completely rid of the too-small mittens!). It was 95 degrees here in So Cal yesterday. I kid you not. But that doesn't mean I'm not up for making some mittens for a good cause. I'll send out an email to my knitting guild, as well. What age group/mitten sizes are these kids? O.K. Lynne you talked me into it:) Sign me up for 2 pairs. I may end up purchasing them if I run out of time. I'd like to participate, too, Lynne. How nice! And I'll make sure to include this on my blog. 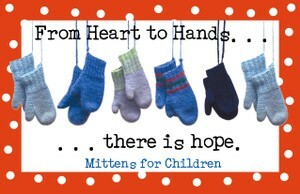 What a wonderful idea, do you have any good kiddo mitten patterns you can share? Please send the address...i'm sure I have at least one or two pair floating around....do you want scarves and hats too? Count me in Lynne - just send me the address and I will send them along! What a heart-warming thought!!!! You can count me in for sure. Just put the details on your blog or send me an email. Are you asking for any particular size? Oh, and you were right, I did think you had sold your house and found another one. Didn't expect the mittens. Wonderful idea and wonderful project. I'll get busy right away and see how many I can whip up to send you. OK children's mittens- I am in! Mittens are on the way this week! One of those little quirky things I knit up for no appearent reason at times, stash them and then wonder "What was I thinking? "...now I know. Any need for a couple of scarves as well? Or hats? Or all the above? Glad you liked the package. Tell JR maybe the mitten box will have some candy. lol. I can do some, too - pass me along a mailing address and I will send them off. I'd love to do this project. Let me know where to send mittens. lynne, your story is precious. please count me in to knit mittens for you. let me know where to mail them. i'll also attempt to recruit members of my knitting groups. I'm a fellow Buffalonian so this is one cause I have to join. I'm living in one of our city's "questionable" neighborhoods while I complete grad school and I see the violence and poverty every day. It will be an honor to use my hobby to help my neighbors. What a wonderful project! (And a great button. )I'm busy knitting hats for our homeless shelter, but I'll knit a pair of mittens if I get tired of hats. Your socks for Emily are DIVINE! Great work! Please let me know where to send some mittens. God's blessings on you, yours and the work of your hands & heart. Great button! Too bad I haven't a clue how to "steal" those things and upload them to my blog. Sigh...computer village ejiit here. But I can, and will, send mittens! Just found your blog and I am so in for this!! Send me the address please! Are you looking for mittens this year too? Id like to help if you are. Got here via Beth's blog...love your header.